Mothers around the world are referred to by their children with word sounds which are strikingly similar, despite speaking in totally unrelated languages. The word for mother: mom, mum, mama, ma, however familiarly or formally it is said, is a universal linguistic thread throughout the world. This is widely believed to be due to the fact the vowel and consonant sounds used in the many variants of this word, are among the very first to be mastered by children whatever their origin. 32 International names for MOM. Languages include: American, French, Danish, German, Chinese, Portuguese, Russian, Catalan, Swedish, Hungarian, Norwegian, Czech, Hebrew, Greek, English, Arabic, Esperanto, Urdu, Spanish, Serb, Japanese, Latvian, Lithuanian, Swahili, Hindi, Latin, Estonian, Polish, Dutch, Tibetan, Irish Gaelic and Italian. 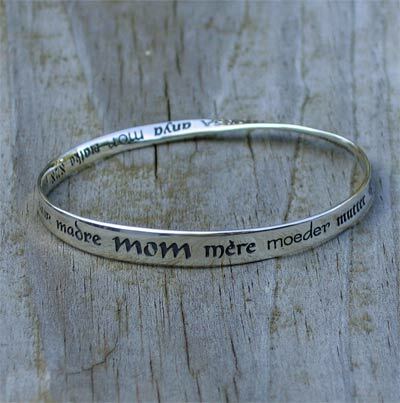 This bracelet - available in .925 Sterling Silver - is a homage to motherhood, and seeks to draw these threads together into a beautiful piece of jewelry. 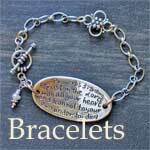 Engraved around this bracelet within and without are the words for mother, mom or ma in thirty two different languages and scripts. The elliptical shape sits comfortably about the hand, while the form itself displays unusual geometric properties. The shape is known as a Möbius strip, after the German mathematician August Ferdinand Möbius [1790-1868]. It represents the seeming paradox of a plane without end, or one of infinite length. As such it became accepted as a symbol for infinity, an appropriate and symbolic form for these memorable inscriptions. CALL FOR OTHER MOBIUS DESIGNS NOT LISTED. 866.834.0356. 203.834.0356.